- Inside Iraq signed the Director of the Department of Registration and students affairs..
Outside of Iraq and be signed by Mr. Director of Registration Department and students and Mr. Rector and then ratified at the State Department and be external either by hand (However, the graduate after the ratification of the university authorized registration department employee and student affairs official letter Facility with a list of names of a set of documents graduates and ratified by the Ministry of external ) . 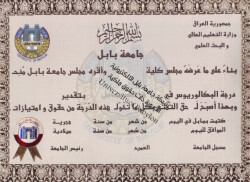 The mural certificate obtained by the student to apply to register and bring the book of the annex to the college connect entitled to the Department of Registration and students / Division of ratifications note that the mural be appreciated certificate only. The student can his registration, which purports to complete his studies outside of Iraq get a transcript of the phases studied before punctuation constraint and authenticated by the Ministry of Foreign Affairs in the same mechanism. 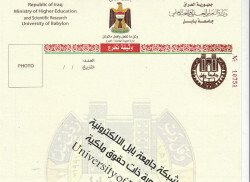 The images below and the official documents issued graduation from the University of Babylon.